Following on from the success of the French and English Suites and the Klavierbüchlein für Wilhelm Friedrich, Christophe Rousset here further explores Bach’s works for harpsichord, this time in the guise of violin sonatas. This is a perfectly arranged programme of six sonatas in six different tonalities. There is no shortage of praise for Christophe Rousset, whether it be for his solo playing or his conducting skills with his self-founded ensemble Les Talens Lyriques; his musical approach has been encapsulated by Gramophone as “music with heart”, and recently MusicWeb praised him as “a very fine harpsichordist”. 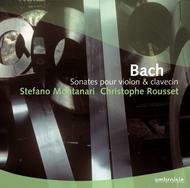 Rousset is joined by violinist Stefano Montanari (“a captivating, animated player” Classics Today).